Diplomacy in Renaissance Rome is an investigation of Renaissance diplomacy in practice. 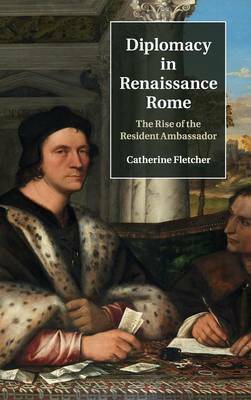 Presenting the first book-length study of this subject for sixty years, Catherine Fletcher substantially enhances our understanding of the envoy's role during this pivotal period for the development of diplomacy. Uniting rich but hitherto unexploited archival sources with recent insights from social and cultural history, Fletcher argues for the centrality of the papal court - and the city of Rome - in the formation of the modern European diplomatic system. The book addresses topics such as the political context from the return of the popes to Rome, the 1454 Peace of Lodi and after 1494 the Italian Wars; the assimilation of ambassadors into the ceremonial world; the prescriptive literature; trends in the personnel of diplomacy; an exploration of travel and communication practices; the city of Rome as a space for diplomacy; and the world of gift-giving.